By Graig Graziosi | December 8, 2018 at 12:09a.m. 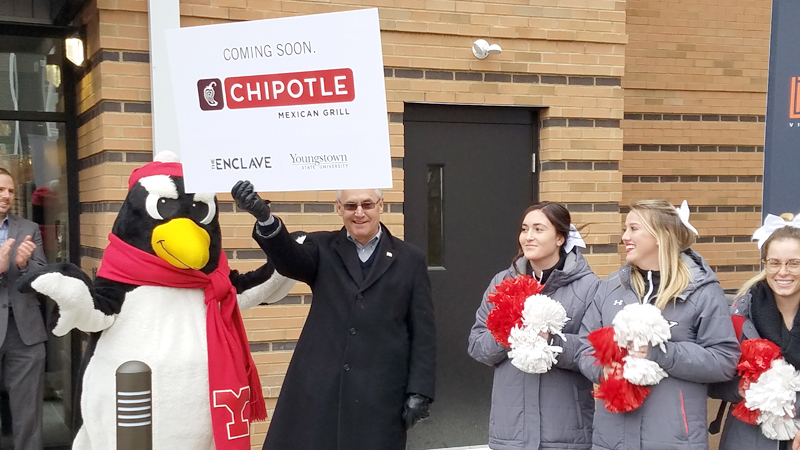 Despite the frigid weather and dreary, gray skies Friday afternoon, a group of Youngstown State University students erupted with glee when YSU President Jim Tressel revealed the latest dining addition to the campus – a Chipotle restaurant. Tressel – along with John Luellen, president of Mercy Health-Youngstown, and Frank Licata, president of LRC Realty – announced the restaurant, as well as a new Mercy Health clinic with extended hours and mental health professionals, would occupy the just-over 8,000-square-feet retail space adjacent to The Enclave student housing complex. The clinic and restaurant are expected to open in late March. Scores of students, coaxed into the cold with the promise of free food, attended the announcement. Though the popular burrito slinging fast-casual diner elicited the loudest reaction, the clinic will address health care needs that have long been sought by YSU students. Cody Dennis, a junior at YSU and a member of the baseball team, said he was appreciative of Tressel and the trustee board for listening to the students and making a health care clinic available for the students on campus. In April, students voted to raise their tuition by $34 per semester to fund a health care facility with expanded services, like mental health care professionals, full-time staff and expanded hours. Eddie Howard, vice president of Student Affairs, said the increase in students living on campus and reaction to student interest largely drove the decision to bring the clinic to YSU. Friday’s unveiling was the latest in a flurry of announcements concerning YSU and downtown Youngstown. On Thursday, the trustee board voted unanimously to extend Tressel’s contract by one year, and on the same day it was announced that Youngstown was awarded a $10.8 million grant by the Department of Transportation for the development of a self-driving vehicle hub in downtown Youngstown. “If you take those developments and add to them the opening of the DoubleTree hotel and the upcoming amphitheater, you see the proof that progress is happening here in Youngstown,” Tressel said. December 7, 2018 2:15 p.m.
April 28, 2017 12:05 a.m.